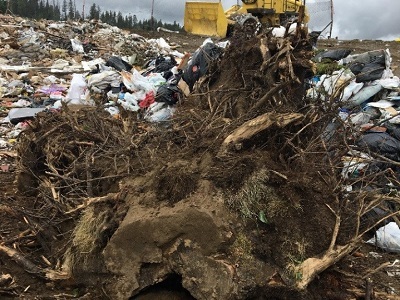 The Regional District of Fraser-Fort George is working hard to minimize the amount of waste that ends up in our landfills. With a Regional Solid Waste Management Plan in place, the RDFFG is promoting the reducing, reusing and recycling of solid waste to help save valuable space in our landfills. Our goal is to reduce our annual disposal rate to 570 kg per capita. Updating the existing bylaw to better define the different types of DLC waste, creating more categories for source separation. Creating tools to educate and inform the commercial sector on DLC source separation. Considering the implementation of lower tipping fees for source separated DLC waste. Why source separate DLC waste? Let’s work together and start source separating waste! Draw up a plan to consider what can be deconstructed for valuable parts instead of demolishing the whole building. 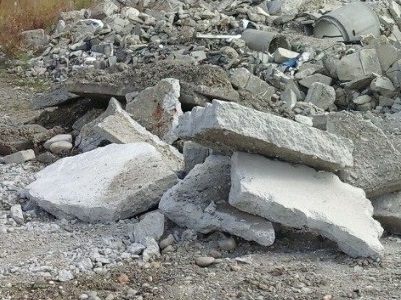 Make sure there is enough time in the demolition plan to source separate the demolished materials. 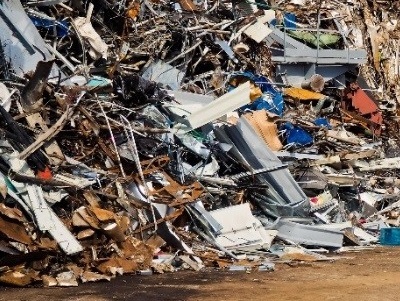 Have space at the demolition site for piling or placing bins for each type of waste. A mixed load of any of the following materials. Source separating these materials before disposal is encouraged! Petroleum by-product, mixed with gravel or crushed rock, used for paving roads and parking areas. 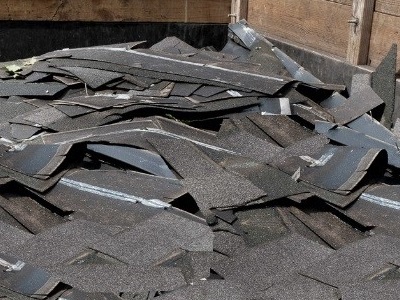 Roofing shingles made from petroleum by-product, not including wrap or torch on membrane. 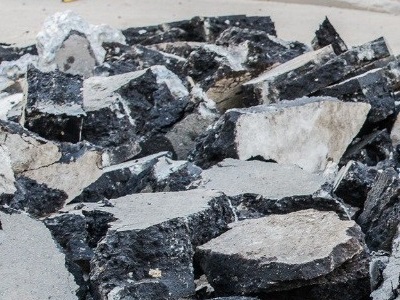 Soil, sediment or fill material without contaminants, refuse or large rocks. Tree stumps free of soil, shrubs and tree branches larger than 75 mm in diameter. 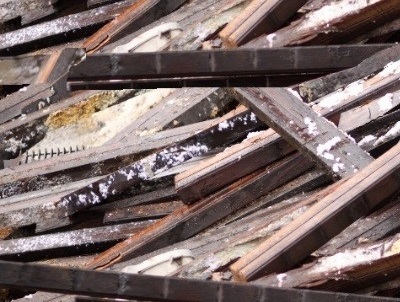 Untreated or unpainted wood waste typically from construction or demolition projects. Small amounts of metal (nails and screws) are acceptable. Wood typically from construction or demolition that is painted, treated with preservatives, or contains adhesives or fillers. 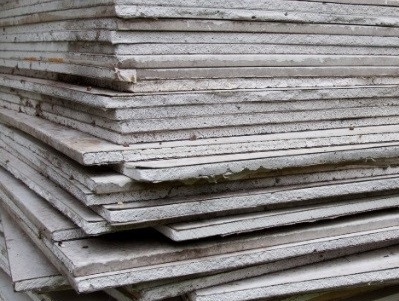 No tile, gypsum, glue, carpet, dirt or soil or non-wood materials are attached. Construction scraps, painted wallboard and/or covered in wallpaper, vinyl, or ceramic tile, but not containing asbestos. Also known as drywall. 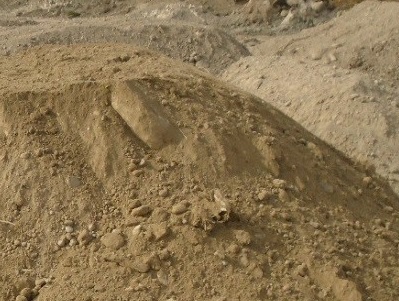 Hardened mixture of cement with sand, gravel and/or rebar. Rebar protruding from cement should not be longer than 1 ft in length. 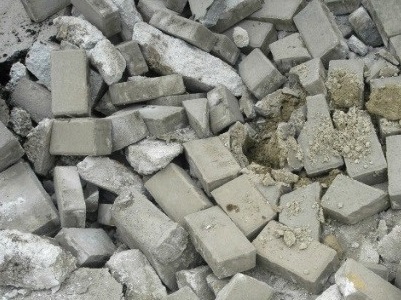 Loose mass of gravel, bricks, or crushed rock. Sheet metal, siding, roofing, rebar, flashing, pipes, window frames, doors, furnaces, bathtubs, fencing, bicycles, but not where metal is less than 50% of the product weight and cannot be easily separated from non-metallic components (e.g. a couch). Double charges may apply to mixed loads. All fees subject to change. Love Food Hate Waste Canada s a behavioral campaign aimed at Canadians to reduce the amount of food going to waste. 17% of all waste going to the Foothills Boulevard Regional Landfill in 2018 was food waste. 63% of the food Canadians throw away could, at one point, have been eaten. For the average Canadian household that amounts to 140 kilograms of wasted food per year – at a cost of more than $1,100 per year. For Canadian households that amounts to almost 2.2 million tonnes of edible food wasted each year, costing Canadians more than $17 billion. Canada’s 2.2 million tonnes of edible food is the equivalent of 9.8 million tonnes of C02 and 2.1 million cars on the road. Every tonne of household food waste that can be avoided is the equivalent of taking one car off the road each year. The objective of Love Food Hate Waste Canada is to inspire and empower residents to reduce the amount of food they waste at home. It is a behaviour change campaign developed by WRAP UK. The UK campaign resulted in a 21 percent reduction in avoidable household food waste in its first five years, saving UK consumers £13 billion pounds. In Canada, a Love Food Hate Waste Campaign has been in place since 2015 in Metro Vancouver. Love Food Hate Waste Canada builds on the proven success of the UK and Metro Vancouver campaigns. It aims to help Canadians waste less by offering simple and actionable tips. 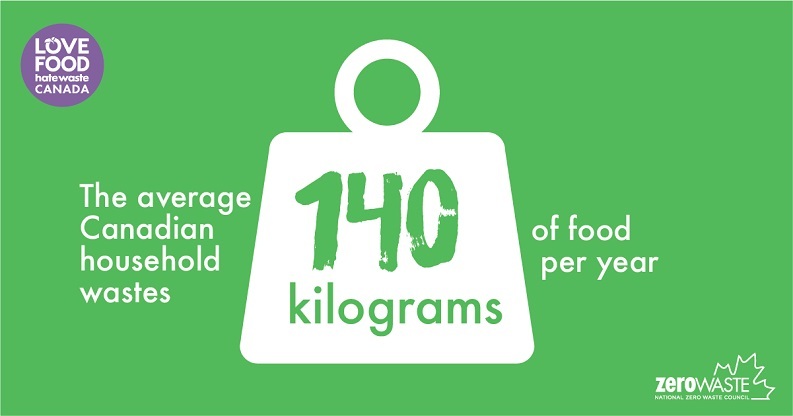 For more information on how you can reduce your food waste, visit Love Food Hate Waste Canada. The Regional District is partnering with the Major Appliance Recycling Roundtable Stewardship Program starting January 1, 2019 to offer a new waste reduction initiative. The partnership with MARR will allow residences of the Regional District to drop off their large appliances for free, including appliances that contain ozone depleting substances, as well as washers, dryers, stoves and a variety of other approved appliances. All appliances must be clean and empty of food. It’s that time of year again when the snow starts falling and many people start thinking about gifts for the coming holiday season. As the temperature starts to drop, hopefully so will the amount of waste we produce. Did you know that we typically generate 25% more garbage during the holiday season than any other time of year? This year we encourage you to reduce your waste, below are some tips to help you do so! Only buy what you need and look for items with less packaging for the groceries. Also, bring your own reusable bags while shopping to reduce the use of plastic bags. When having people over plan ahead and don’t cook extra. While serving the home cooked meals use reusable dishes instead of disposable ones. Eat all the stocked up food in your freezer that way if you cook too much you’ll have room for all those delicious leftovers. When sending invitations opt for the least amount of waste possible, send e-cards instead of paper, or if you do send cards out use those made from recycled content. Skip buying new and reuse old Christmas ornaments, or make them yourself with friends and family. Many people like the smell of a fresh tree in the house during the holidays, instead of cutting down a live tree get a potted tree and then plant it in the spring. If you are sick of your old decorations, try swapping with a friend to spice up your tree, or wander second hand stores such as Value Village, Hospice Resale Shop and the Salvation Army Thrift Store for hidden treasures from past holidays. When upgrading to new decorations such as lights, make sure to recycle them at the correct facilities. For more information on where to recycle lights check out LightRecycle, one of British Columbia’s product stewards. For more information on Product Stewardship click here. Give out gifts such as gift cards, tickets to movies or local events instead of large bulky items. It may sound obvious, but some of the best gifts are personal, look for the experiences people can have instead of the possessions. Is someone you know crafty? Check out community calendars to see who is offering classes in the coming year on things such as painting or pottery. Many things are now meant to break after a certain time period, look for items that are built to last. An easy option is to find a fabulous kitchen gadget that is simple and skip those with batteries and breakable parts. Old newspapers and magazines make great alternatives to new wrapping paper, or use gift bags that can be reused. Also try shredding paper instead of using Styrofoam peanuts for packing boxes. When opening gifts try to save the wrapping paper and bubble wrap for next time. When recycling make sure to separate your recyclables from your garbage to make disposal easier. Take the separated recyclables, paper, cardboard and wrapping paper to a local recycling facility or fill your curbside blue bins. Instead of throwing away food scraps you can compost it in the back yard. However, due to wildlife concerns we do not allow them at our facilities. 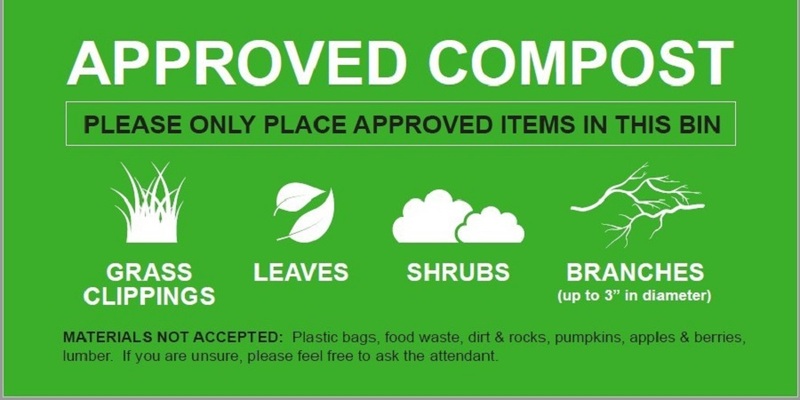 Below are the approved compost allowed at our facilities. Christmas trees can be dropped off free of charge at a variety of our facilities. The Regional District sells composters like the one pictured below, for more information click here. Make sure to secure your load when visiting any Regional District facility and remember that all facilities will be busier during the holiday season. For more information and hours of operation at our landfills click here and for our transfer stations click here. Sort Smart is a campaign to help you divert recyclables from your garbage and the landfill. 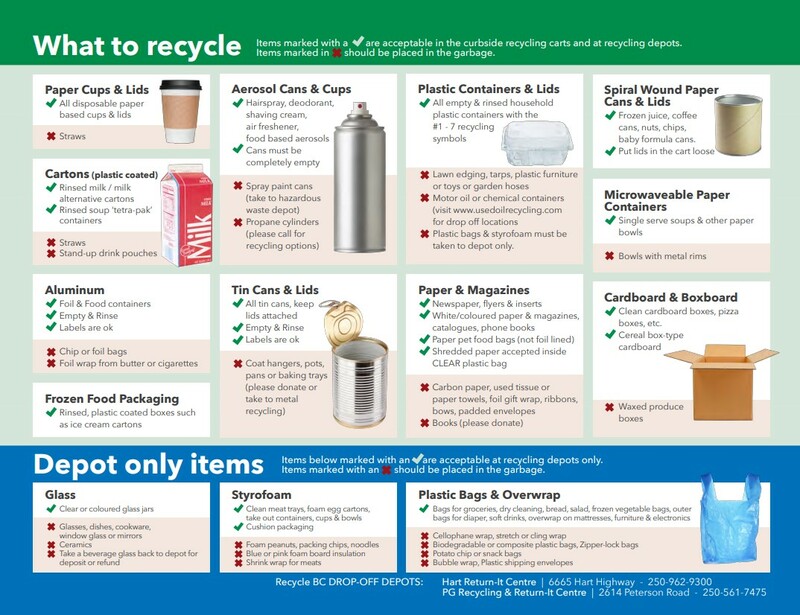 It provides guidance on how you can properly sort your recycling and where to take it. Why should I participate in Sort Smart? Taking the time to divert and recycle your products helps increase the lifespan of our landfill. 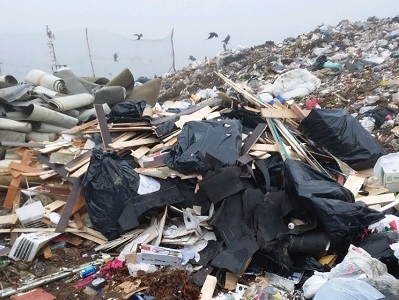 Being smart about how you bring solid waste to the landfill can save you money. Where can I take my sorted recyclables? How do I Sort Smart? Check out the guide we’ve provided down below! As of January 1st, 2019, the RDFFG wants to remind all commercial customers that the final phase of the Commercial Cardboard Diversion program begins. The tolerated amount of cardboard decreases to 5% of the entire load. 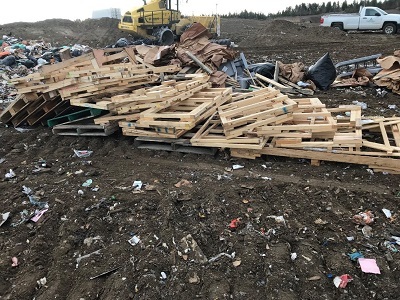 Any commercial load of waste that contains more than 5% cardboard will be subject to a surcharge under Bylaw 3023. Removing this recyclable item from the waste stream will save valuable landfill space, energy and resources. All loads of cardboard must be clean of contaminants. This includes: Styrofoam packaging, plastic and metal. Cardboard should be folded to make as much space as possible in each bin. Cardboard bins that have high levels of contamination require additional time and resources to sort and may even be rejected if contamination levels are too high. For more information, or if you have any questions or concerns, please contact the Regional District of Fraser-Fort George at 250-960-4400 or email environment@rdffg.bc.ca. The commercial sector is the largest contributor to the amount of waste generated, almost 60%, and represents the greatest potential for successful diversion. Will residents be effected by the surcharge? Residents will not be effected by this new program. The Regional District encourages all residents to sort smart and recycle their cardboard. When does the surcharge come into effect? Phase 2 of the program begins January 1, 2018. What does the Regional District mean when they talk about Threshold and Surcharge? There are two components to the implementation of this disposal program: threshold and surcharge. The term threshold refers to the tolerated amount of cardboard allowed in each load and surcharge refers to the penalty charge if the amount exceeds the threshold. What are my other disposal options? If a business would like to recycle SMALL LOADS of cardboard on their own, there are a variety of LOCATIONS where cardboard can be recycled.